Extreame Savings Item! Save 45% on the TOCC-Senlai Adjustable Road Mountain Bike Bicycle Cycling Tire Front/Rear Mud Guards Mudguard Fenders Set by TOCC-Senlai at Melon City Bike Club. MPN: 201330055068.6. Hurry! Limited time offer. Offer valid only while supplies last. TOCC bike fender: feature: 1. Any road or MTB cyclists perfect fender. 2 easy to install and disassemble, suitable for mountain bikes, road bikes. 3. 1. Any road or MTB cyclists perfect fender. 2 easy to install and disassemble, suitable for mountain bikes, road bikes. 4. Rear fender height adjustable. You will enjoy these TOCC-designed bike fenders. 【Sturdy durability】 It is a fashionable bicycle fender set which adopted PA material which is hard to break and durable and thought stylish. Ideal for commuting and school attendance..
【Practicality】 When it suddenly rains, it stretches and guards mud bouncing. It is a mud guard adopting a sliding type structure that collapses small when the rain stops unnecessary. It is a slide type rear fender which can be easily attached to the seat post. 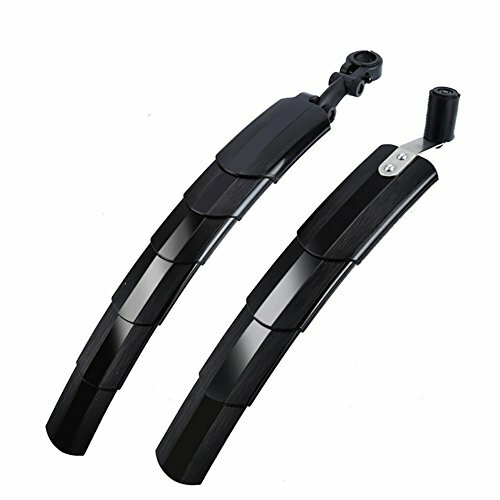 【Easy installation type】 Mud guard set for front wheels and rear wheels, easy to install and remove according to various scenes such as weather without needing tools. Even if you are out of the first and second rows from the outside of the fender behind in the stage of being installed, it is easy to fit and use it as it is restored. You can carry it compactly by removing it and shrinking it. 【Expandable slide type】 Front bicycle mudguard: 120 mm --- 300 (maximum) Rear bicycle mudguard: 130 mm - - 400 mm. Since it is foldable, it is also suitable for indoor keeping, narrow parking lot, bicycle, folding bicycle, automobile, cycle trailer and so on. 【Package and 1 year warranty】 & 【Bicycle size correspondence】: 1 x Front bicycle mudguard 1 x Rear bicycle mudguard Unopened / unused items only accept returns within 30 days after delivery. * 16, 18 inch, 20 inch, 22 inch, 26 inch, 700C passing type bicycles are applied, and it is a big success in mountain bike, road bike, cross bike, etc. Ideal for folding bikes in particular! If you have any questions about this product by TOCC-Senlai, contact us by completing and submitting the form below. If you are looking for a specif part number, please include it with your message.